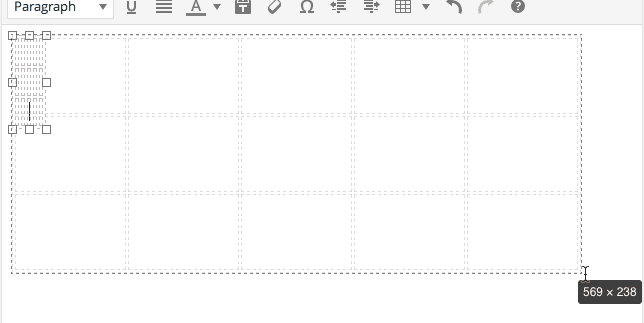 In the Writing Toolbar is a button to add tables. It is in the second row. If you do not see the second row, click the Toolbar Toggle button in the top row to expand the toolbar. 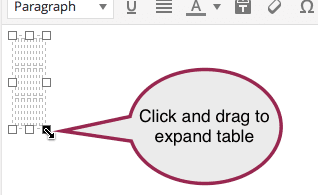 Click the Table button to add a table. Select the Insert table option and choose the number of rows and columns you think you will need. You can always add or remove columns and rows later. If the table fields are too small to enter data into, click and drag one corner to expand the table. You can also use the Table properties to select a width in either pixels or percentage. To do this, select the table and click again on the table button. 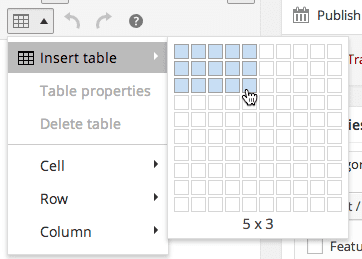 Select Table properties from the drop down options available. Type in the width in either pixels or percentage. For example, 800px or 100%. Enter in your data in the appropriate fields. Update/Publish your page or post to see your new table. You may need to add or remove rows and columns, style the table with background colors, add borders or cell spacing or padding. All of these can be done using the options in the table button. Select your table. The corners of the table with have open boxes when it is selected. Select from the available options. 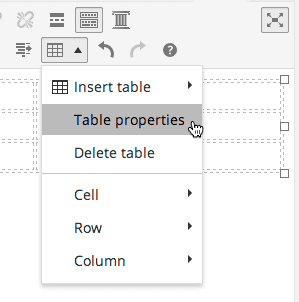 These include Table properties, delete table, cell properties (including merging and splitting cells), row properties including inserting/deleting rows, and column properties including inserting/deleting columns.